'hunting songs' is the latest album by timothy cushing, a maine musician currently "living on an island in korea" (that got me intrigued right away). the album opens with a tune that perhaps is influenced by cushing's current living situation...an instrumental storm of a tune where eastern influences meet the appalachian holler with the squeal of a fiddle and the ringing of a gong. the album grows more interesting from that point forward, as cushing begins to sing and pushes the boundaries of folk instrumentation, with pounding drums, wailing strings and droning organs. 'hunting songs' is a rare, weird bird and i highly recommend giving it a solid listen. listen to more of timothy cushing's tunes right here. he has even done a christmas album! the following two videos show live performances of a couple of tunes from folk singer andy dale petty. petty is a troubadour who is no stranger to the road. he brings a brassy old time folk singin' sound to these songs with clawhammer banjo and a traditional song structure on 'train on the island' and heavy strums on a big 12 string guitar and harmonica accompaniment on 'stick to the shadows'. find out where to catch andy on tour right here. 'pine' and 'cotton' are two acoustic guitar meditations by young guitar player and songwriter eli winter. the two songs contrast with each other to form two sides of a coin. 'pine' is a quiet, whistful, fingerpicked tune, where 'cotton' is a bright, driving, strummed exploration. listen to more of eli's tunes, including an a nick drake cover, right here. hinterlands, the soon to be released new album from california acoustic folk duo the velopheliacs, features dark strummy vibes that provide a framework for a haunting voice that sings spooky lyrics. the band makes the most out of a two guitar sound, and it really works for them. they can take it from a rhythmic clang to a melodic flow and even a slightly cosmic swirl and back again with ease. sample the title track below. the album is due out "later in 2014". buy it right here. i really like this music from nocturnal poisoning, the work of a dedicated black metal man gone acoustic. i never really thought i'd get to say something sounded a little like some takoma style stuff mixed with emperor, but this actually does. precise but soulful layers of acoustic riffage that blend appalachian vibes with nordic darkness, accompanied by subtle touches of percussion. this music also evokes the more mysterious, stone henge-y vibes of 60's british folk such as pentangle and clive's original band, minus the hippy type lyrics. nocturnal poisoning is all about natural, dark and mystical moods. the only place to listen to this stuff right now is youtube, so check it out here (youtube playlist contains some tracks by the man behind nocturnal poisoning's old electric band, xasthur). 'the greatest show on mars', due out on june 17th, is the fourth release by indie/americana act (and apparently really old guitar collector) clothesline revival. the music is a patchwork quilt-like americana pastiche, containing roots instrumental techniques, electronic beats and touches, and samples from field hollers and old radio sermons. check out a few preview tunes below. get 'the greatest show on mars' and clothesline revival's other albums right here. 'old fashioned pound notes' is the lead track off of the latest EP by veteran glasgow, scotland folk and rock musician christopher james sheridan. a quiet, nostalgic folk song, 'old fashioned pound notes' characterizes sheridan's solo sound, a classic, well performed take on the folk revival sounds of 1950's and 60's london and new york. listen to more of christopher james sheridan's music right here. that noise is an LA area indie/electro/pop outfit that has been making southern california dance and party hard for some time now. 'you got it all' is their brand new single, self styled as a feel good summer jam. it just might fit that bill with its self affirming lyrics and catchy synth-based hooks. 'black ribbon' is an ominous, driving, stomping 'swamp rock' tune by new york band the tall pines. The song blasts along with a gritty jerry reed-esque riff, banging tambourines and snakey organs. All this provides a setting for some nothing-held-back male and female vocal performances. listen to more from the tall pines here. 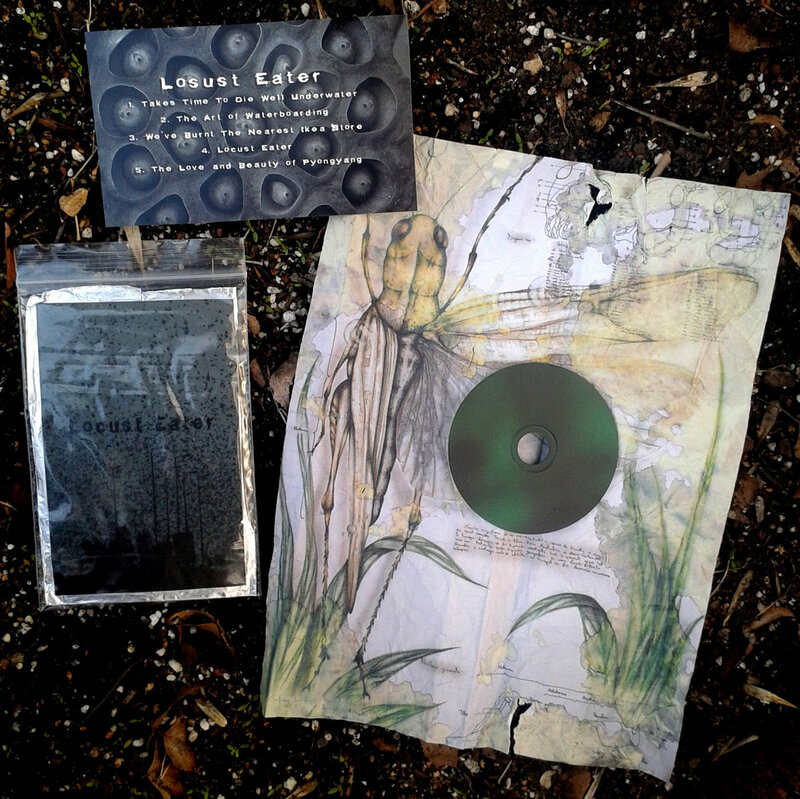 another in the group of polish noise releases i have been receiving, one-man noise project feldgrau's 'locust eater' feels like a collection of punctuated sonic atmospheres. wastelands of static shattered by harsh electronic blasts, frosty gurgling winds and chirping that die off abruptly. isolated crumbs of noise. it feels harsh and it is probably supposed to with song titles like 'the art of waterboarding' (an apt title for the particular tune, which sounds like water in many ways) and 'we've burnt the nearest ikea store'. name your price for it digitally right here, or head over to the darker days ahead label out of minneapolis, MN and grab it on spray painted 3" CDR in a ziplock back with a tinfoil sleeve and 'damaged paper' liner notes (yes). name your price for it right here. another thing a recorded, using the technique of 'prepared guitar'. another practice record. get this and all the other practice records here for free. brooklyn, new york based anti-folkster paul weintrob has been in the bedroom recording game since 2009 (or at least that is his earliest release on bandcamp). his latest album 'elbowtoe' features the lo-fi aesthetic and introspective, almost rap-like verbal acrobatics you would expect from someone placing themselves in the anti-folk genre. what sets paul weintrob's 'elbowtoe' apart are the somewhat jazzy and unexpected instrumental turns to be heard on this album, with some quality fingerpicking, fiddle and viola arrangements making pleasant appearances. folk singer jen starsinic's debut album 'the fire and the flood' is stately entry into the world of contemporary folk music. smooth harmonies delivering sad, sad words, aching fiddles, thoughtful, sparse drumming. i have been trying to stay away from easy comparisons lately but this album's melancholy vibes, classy production, and the southern lilt of starsinic's voice do remind me of gillian welch's most instrument heavy effort, 'soul journey'. new york based singer/songwriter and multi-instrumentalist joanna sternberg, whose last release with her band squirrel ship i featured here, has just crafted a new album highlighting her skills as a solo performer, called 'lullaby to myself'. her music sounds good in this stripped down setting that highlights her timeless sounding voice. she has dropped a few live videos to accompany it, one of which is the one you see below for the bittersweet love song 'i'll make you mine'. stream 'lullaby to myself' below.